It ain’t easy being the middle child. And so it is with the Cayman. The misunderstood Cayman. It’s Porsche’s middle child. The first born 911 is the one that everyone understands. It’s an icon. The Boxster is the baby, and it makes sense to many on a different level. It’s the gateway drug into the Porsche world. But many don’t seem to understand the Cayman. You’ll get the “Get a few options, and it’s costs as much as an entry-level 911. Who would buy this?” or the “Why wouldn’t I save 20 grand and just get a Boxster? I even get a convertible roof thrown in!” reasoning. 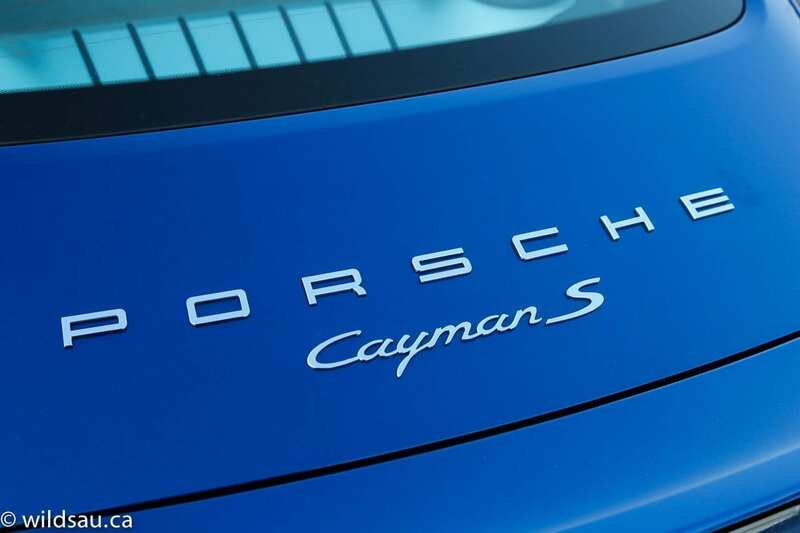 There are plenty of arguments for and against the Cayman – on paper. Everything changes once you’ve driven one. I’ve found that’s the case with almost any Porsche product. 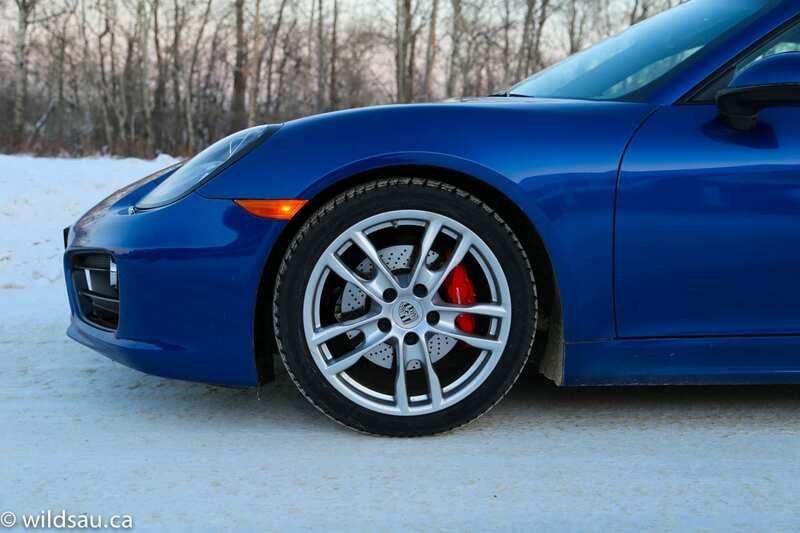 The 2014 Cayman is very much a Boxster with a hardtop when it comes to its styling. And that is a very good thing. 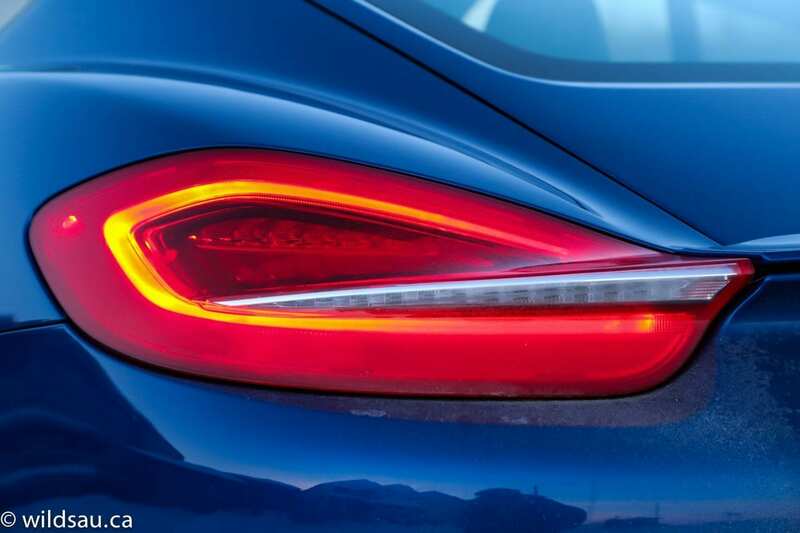 Instantly recognizable as a Porsche, the slick mid-engine car is low, aggressive, seductive and just plain gorgeous. The fact that it resonated equally with men and women during my week with it speaks volumes. It’s a successful styling exercise from nearly any perspective. Mine came in aqua blue, a beautiful colour, but probably not the one I’d pick for my own Cayman. Wheel wells were filled by gigantic optional 20-inch rims wearing big 235/40s in the front and huge 265/35s in the back. As awesome as they look, they almost make the brakes look a bit small. In my opinion, it’s the slickest looking Porsche model. Here’s where the magic happens. Midship, right behind the front seats where it belongs, sits a 3.4-litre flat-6 boxer engine. 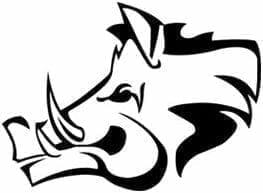 It cranks out 325 horsepower at 7400 RPM and 273 lb.ft of torque at 4500 RPM. 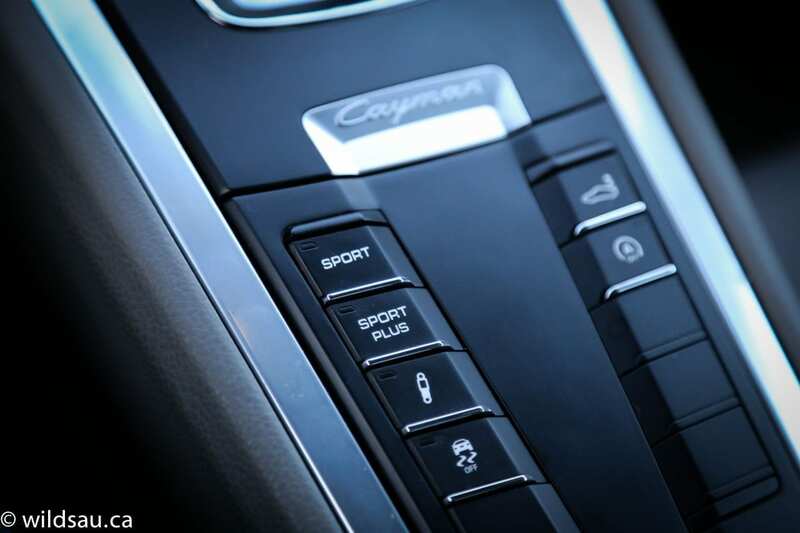 The rear wheels are driven, the power being sent through Porsche’s dual-clutch 7-speed PDK transmission. The Cayman S is rated at 11.2 L/100 km (21 mpg) in the city and 6.2 L/100 km (38 mpg) on the highway, though I’d rather not discuss what I averaged during my week with it. It has a 64 litre tank and requires premium fuel. It’s amazing how many people asked me whether the Cayman is fast. Of course it is. Let’s get this out of the way. The S, optioned as I had it, does the 0-60 (0-100 km/h) run in 4.7 seconds. Without the Sport Chrono package, it takes 4.9 seconds. Either way, that’s fast. Real fast. The engine is powerful, even from low RPMs, but its true potential shines at high revs. Keep it over 3000 and it becomes a much more rewarding, thrilling driving experience. It pulls hard, and the boxer’s frenetic mechanical yowl is addictive! 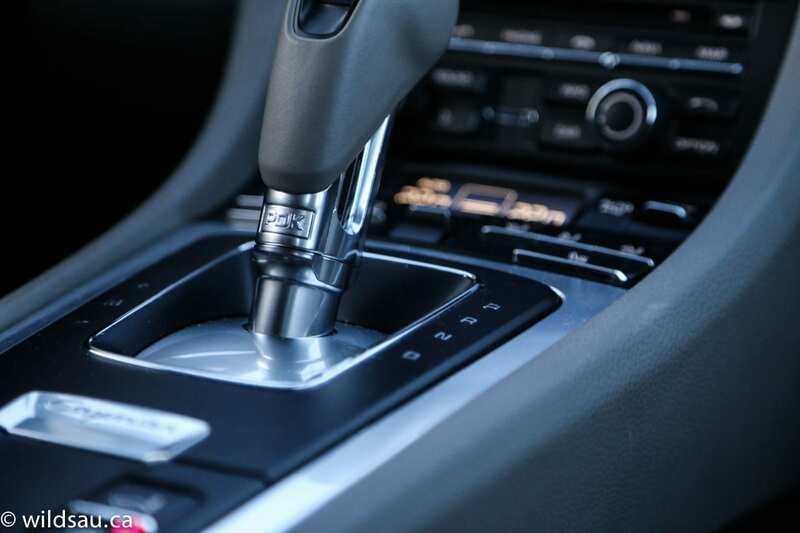 Balking at the “automatic” transmission? 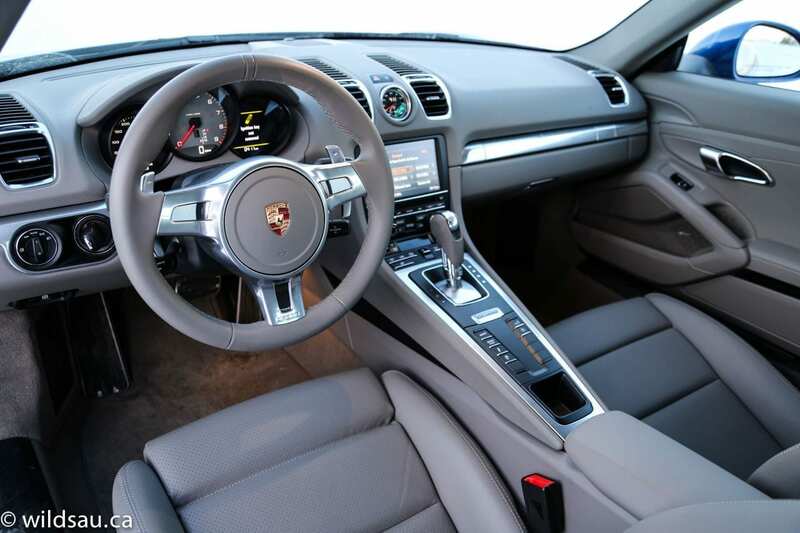 If you haven’t driven a car with Porsche’s PDK, you can be forgiven. I am constantly astounded by the incredibly accurate predictive nature of the PDK. Trundling along through town, it’s as cuddly as a kitten, lobbing imperceptibly smooth gear shifts your way, and just being invisible. 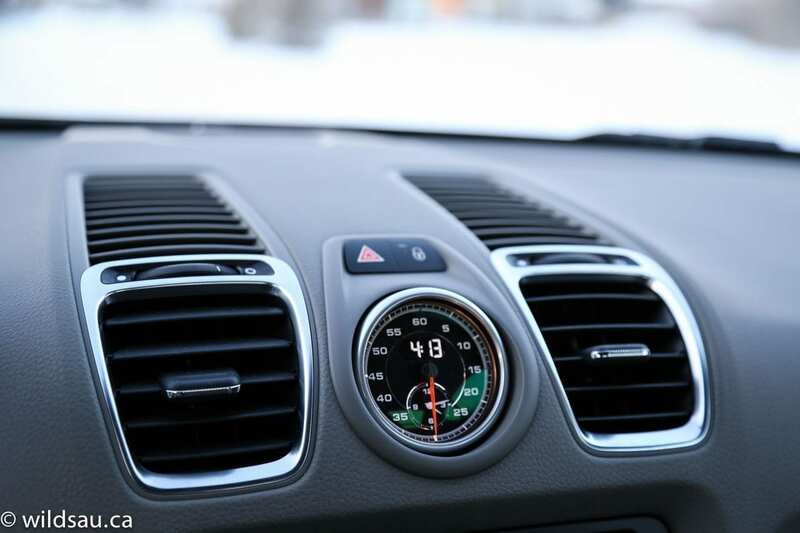 Put it into Sport mode, and it hangs on to gears longer or happily downshifts to whatever gear is appropriate, while the car reacts more quickly to your throttle inputs. If you’re feeling adventurous, or headed to the track, try out Sport Plus mode. It will rev to redline anytime you want, holding on to the gear until you think pistons will come flying out of the rear hood, and the PDK bangs off shifts violently, and quicker than you can say sauerkraut. Perhaps the most memorable part of this transmission every time I’ve driven it is how clairvoyant it is. It is almost creepy how it knows exactly – EXACTLY – what gear you want at any particular moment. It never left me hanging. And that in itself is worth the cost of the upgrade. With all that said, the PDK can also be shifted manually with paddles (great ones too!) or the gear selector. Gear changes are insanely quick but frankly, I was never disappointed when I left the transmission to its programming – it’s that good. 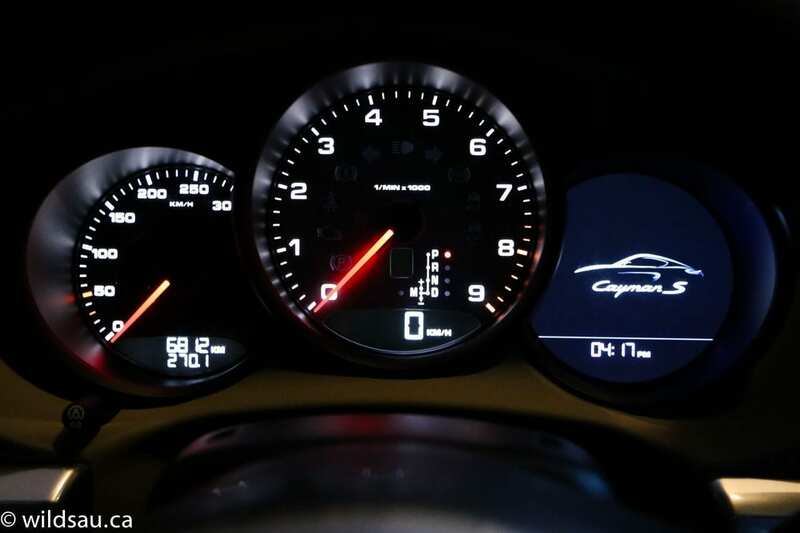 But straight line performance isn’t what the Cayman S is all about. Its mid-engine configuration means that the front/rear weight distribution is nearly perfect, and that the weight is centred. It means the handling is sublime, and the car’s balance is flawless. And it means that given the opportunity, the car will absolutely scramble your kidneys as your carve your way around any corner at any speed you see fit. It’s unflappable, calm and collected and willing. How do I know this? Because I’ve abused a Cayman and found it to be nothing short of amazing. But not this one. I couldn’t abuse this one. 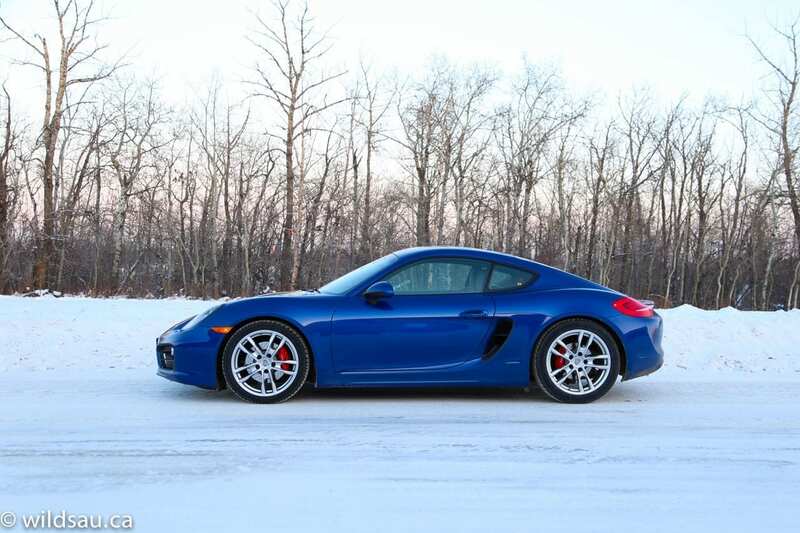 Unfortunately, I took delivery of this Cayman in the dead of winter in Edmonton – we got several inches of snow and temperatures dropped to you-need-antifreeze-in-your-blood levels. Not the best way to showcase a Cayman S, Porsche, but I’ll take it. As a winter car, it did alright but it’s definitely not at home in the snow. Traction was an issue, even when fitted with stellar winter tires. The wide rear tires make for a massive contact patch, and there’s altogether too much rubber on the road, spreading the weight out too much. The traction control does what it can, but it can only help you maintain the traction you have – it can’t really add any, and therein lies the issue. 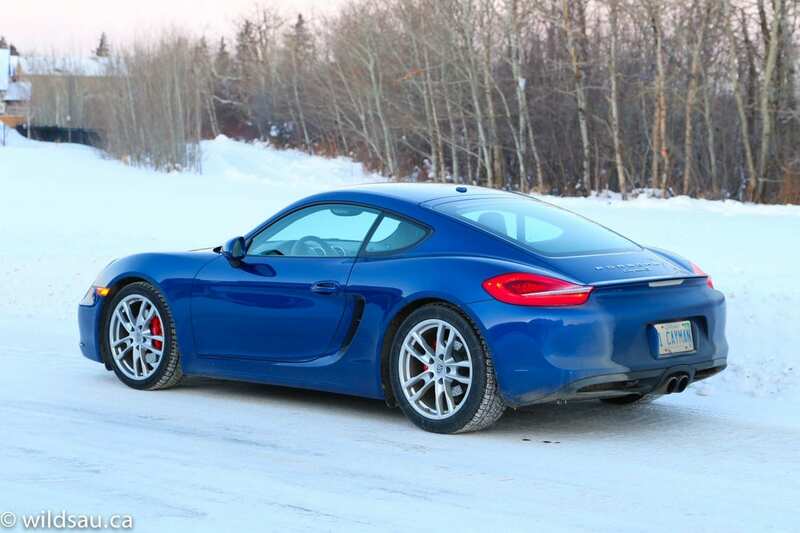 The Cayman takes its sweet time getting a move on from slippery intersections (read: every one of them in Edmonton) and any time you get on the gas, the rear end gets squirrelly. Brakes are incredible, and the visibility is decent. 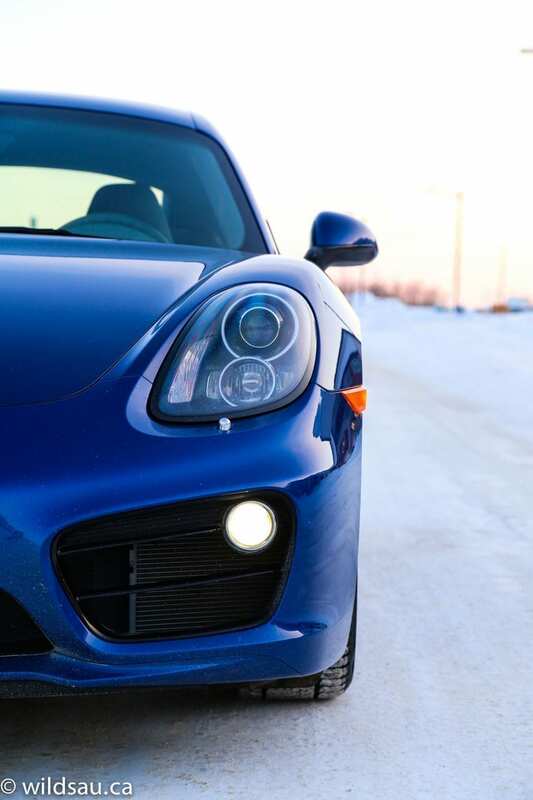 Overall, you could survive the winter in a Cayman, but you’ll be much, much happier on dry roads. You know you’re in a serious sports car the second you ease yourself into the low-slung seating position. The view of the road is fantastic though, and you’ll quickly feel at home in a cabin that feels awfully familiar if you’ve been in a recently built 911, Panamera, Cayenne, etc… The elevated console is an ergonomic nightmare, and the multitude of identically shaped and coloured buttons that I’ve bitched about before shows up here in full force. The awesome Sport Design steering wheel is a bit of a hypocritical move. Devoid of any buttons to allow you to focus on the driving experience, it just requires you to completely take your eyes of the road so you can find the button on the console that you need. 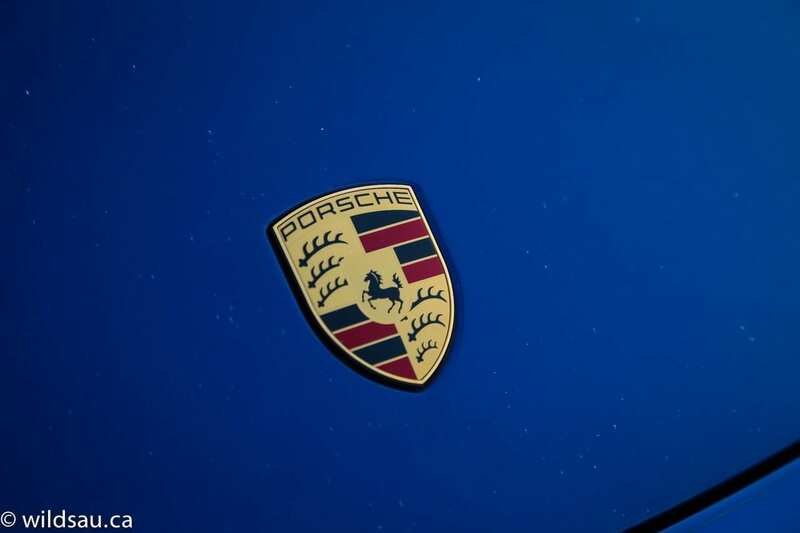 Whatever – Porsche will be Porsche and in this department, the staunchly Teutonic madmen won’t be changing their tune any time soon. 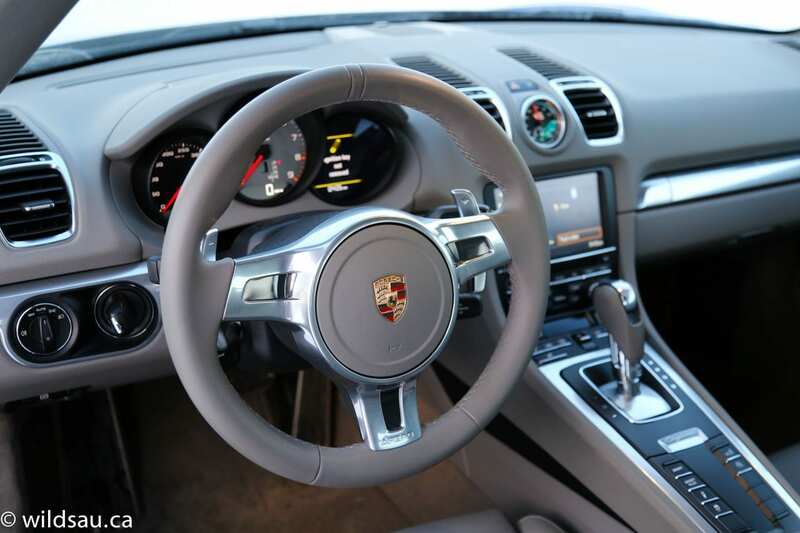 Behind the steering wheel is a three-ring cluster – two are gauges, the third is a round driver information screen. 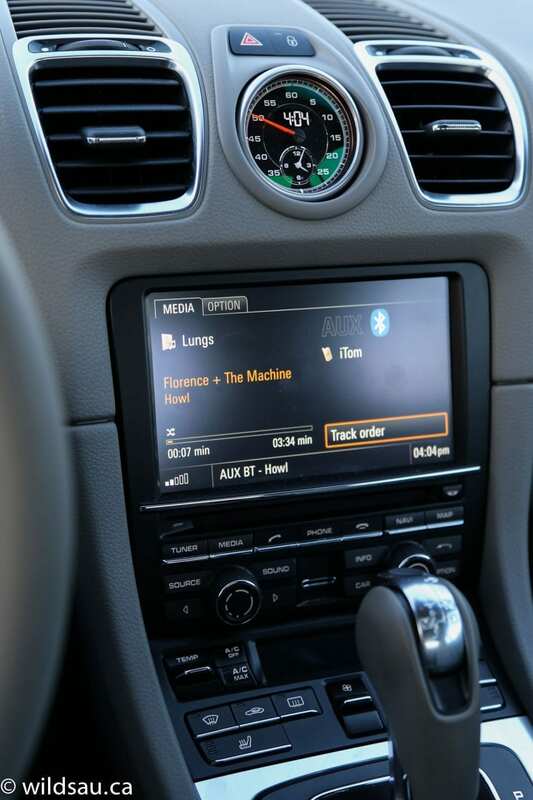 There’s enough tech to make most nerds happy, though the touchscreen-based infotainment system has a strange user interface and is a bit confusing. The Bose sound system is pretty good, once you figure things out. 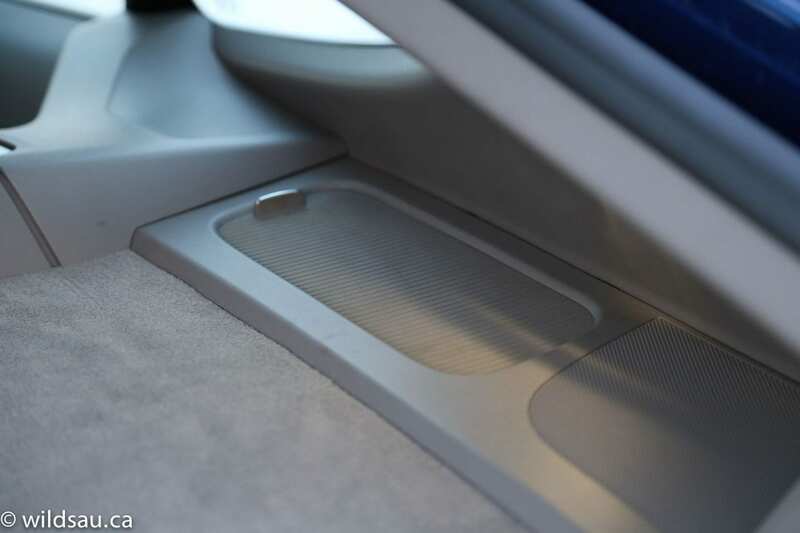 Materials are very nice – the dash is crafted out of soft-touch plastics – the seats are beauties to look at and are perfectly comfortable and supportive – the fit and finish is fantastic. There’s very little space to put anything anywhere. 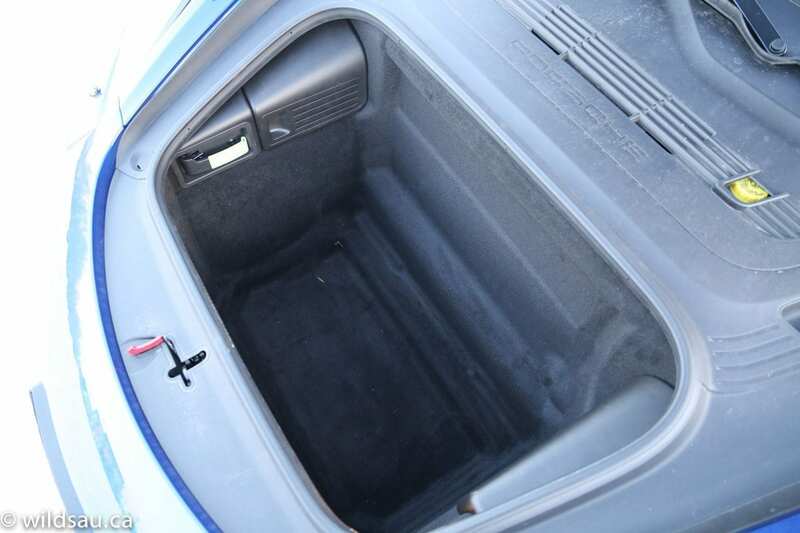 A glove compartment, tiny door bins and a laughable center console bin is about it. Thankfully, the trunks offer more room if you need it. Yes, I said trunks. There’s a front one under the hood – it’s a deep well of about 150 litres, and can hold a few soft bags or a large suitcase. 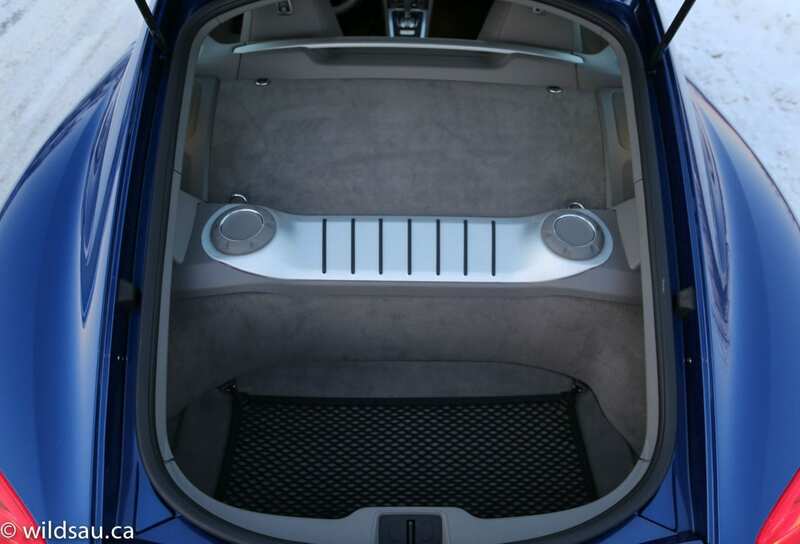 Then there are the 275 litres in the rear comprised of the luggage shelf right behind the seats (over the engine compartment) and the storage well at the very back under the trunk lid. 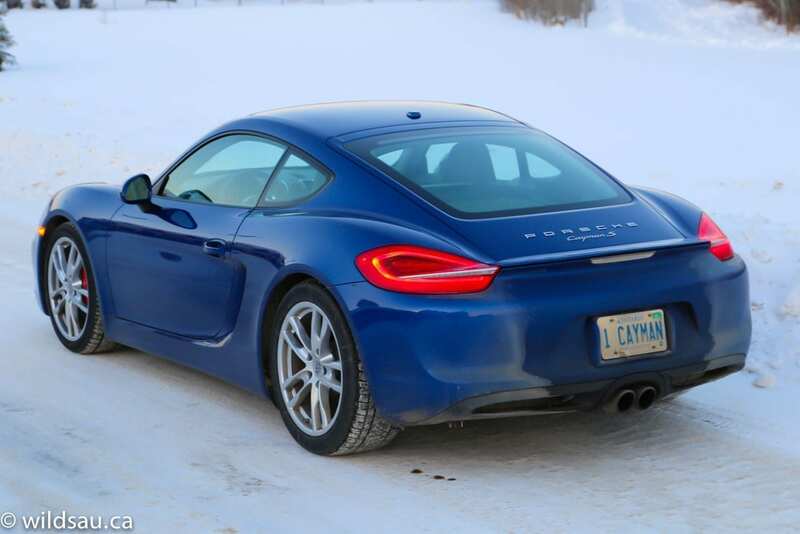 While it was unfortunate that I had to review this car during the winter, it didn’t diminish how much I love the Cayman. Its ability to connect with your senses, your wants and your needs is almost unparalleled. No, it’s not the fastest thing out there. But it’s plenty quick. And the way it willingly transitions between a nice, comfortable commuter car to an insanely capable track car is nothing short of astonishing – and the fact that it does well in either environment and all the spaces in between is a testament to Porsche’s engineers. They’ve managed to wring jaw-dropping levels of performance out of a car that you could give granny a pleasant ride to church in. I give the Cayman S an 8.5 out of 10. I’d give it a 9, but it simply wouldn’t be a car I’d want to live with in the winter. And here, in Edmonton, that matters. If you’re looking for the perfect all-weather Porsche for this kind of climate, check out my review of the Carrera 4S Cabriolet. WAF (Wife Acceptance Factor) was not that great. Obviously the lack of cargo room didn’t go over well for the Queen of Shopping, and she thought it a bit loud on occasion – especially the droning on the highway. The lack of lit vanity mirrors was the Cayman’s final straw. Like I said, whatever your misgivings against the Cayman might be, or whatever it is that you didn’t understand about its place in the world and within Porsche’s line-up… all those questions are moot once you’ve driven one. I can’t imagine someone shopping for a sports car, driving a Cayman S and coming away from it with a myriad of complaints. Everything about it made it desirable to me. If you can swing the price tag, and if you can sacrifice the back seats and cargo space, this is the sports car that will make any enthusiast yearn for more time behind the wheel.